A key part of what we do is to provide industry leading commercial reports and advisory services to support conveyancers with completing successful property transactions. 2019 is an exciting year for us, as we focus on updating and improving a number of our commercial reports, including our industry leading official Coal Authority CON29M – a key mining search required for properties located on the coalfield. 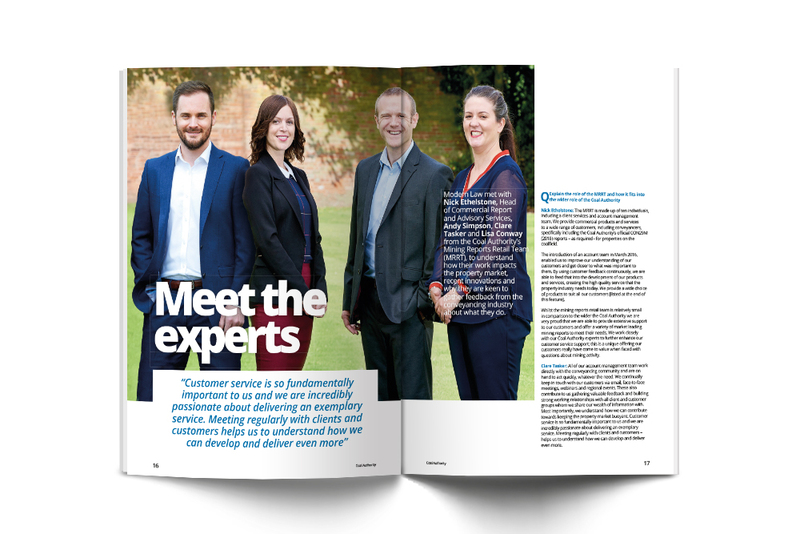 We recently spoke with Modern Law Magazine to outline our ongoing commitment to supporting the legal and property sectors. We explain how important it is for us to continue gathering feedback from our customers, to make sure that we continue to innovate and refresh our products in line with what our customers need. At the heart of everything we do is our core purpose – to manage Britain’s mining legacy. Our focus on keeping the public and environment safe underpins everything that we do. As such, we have in house teams including geotechnical engineers, environmental specialists and experienced mining surveyors.